Join NIRS Thursday, November 30th, 6:00 pm at Busboys and Poets, Takoma Park for an evening with activists and experts on grassroots climate justice movements in India. With the signing of the 2008 US-India Nuclear Deal, the government of India opened its doors to a global nuclear industry hungry for new markets, touting new nuclear agreements as key to boosting development and electrifying its hinterlands. 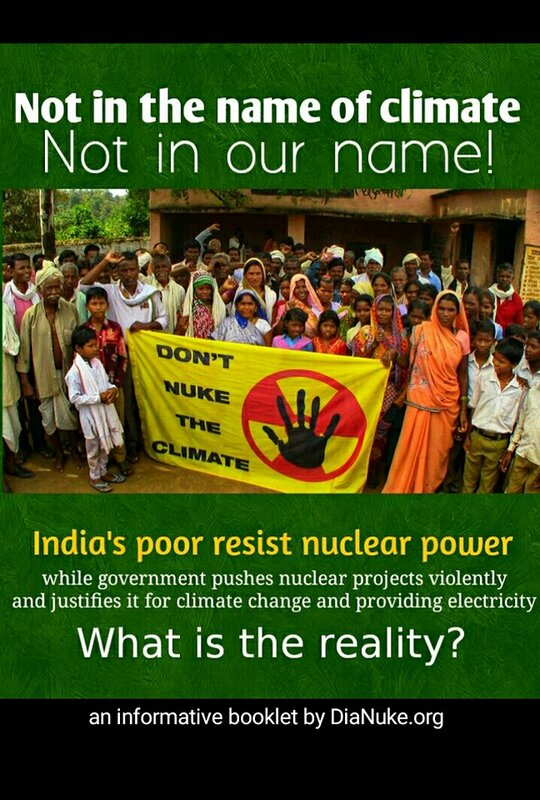 Indigenous communities and environmental activists are resisting nuclear power projects promoted as climate solutions. Kumar Sundaram is the editor of DiaNuke.org, one of the go-to sites for independent information on nuclear power in India, and just published a detailed analysis on democracy and nuclear power development. ann-elise lewallen is an associate professor at UC Santa Barbara studying Japan’s transnational reactor export agreements with India, as well as environmental justice impacts on indigenous communities. Kumar and ann-elise will discuss the climate justice movement in India and assess the new nuclear renaissance in the developing world. The event will take place Thursday, November 30th from 6:00-8:00 pm at Busboys and Poets, 235 Carroll St. NW, Takoma Park, MD 20012.